Shea Homes unveils a new app that will help retirees stay social. Active adult communities are known to offer a rich lineup of amenities along with a welcoming and exciting social atmosphere. These communities were developed with active and vibrant lifestyles in mind that allow Baby Boomers to mingle with other like-minded adults in a friendly setting. The social scene in many of these communities is typically packed with activities and events that range from weekly pool parties and movie nights to bocce ball leagues and card games. 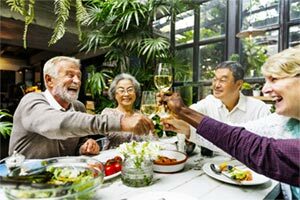 Retirees are also drawn to active adult communities because they want to build lifelong friendships as well as have a close-knit vibe with members of the community. Unfortunately, this is not always the case. According to a recent study done by Shea Homes, about 37 percent of homeowners over the age of 50 have made zero new friends over the past year. It also showed that 46 percent of active adults stated that their social network had diminished due to friends moving away from their neighborhood. In addition, the study also showed that more than 60 percent of Boomers want to live in a community where they know their neighbors. So how can Baby Boomers make new friends once they move into an active adult community? According to Trilogy by Shea Homes, the builder has found a way to meet the needs of retirees who are looking for new ways to enhance their social circles to foster new friendships. Trilogy has introduced a social intranet platform called MyTrilogy.com where residents of Trilogy communities can instantly have access to community events and activities exclusive to its members. The site allows all homeowners in Trilogy communities from across the country to stay connected on one social network where they can view clubs, activities, community news, and upcoming programs as well as register for classes, spa services, or on-site dining experiences. The site also allows members to connect, meet, and interact with the other 18,000 participating Trilogy members locally and nationally, making it easy for retirees to make new friends who share similar interests. "Our intent for people who move to one of our communities, no matter where they are in the U.S. or what interests they may share with others, is they become happier than they were before they made the move to a Trilogy community," said Jeff McQueen, President of Trilogy by Shea Homes in a press release. "Yes, we build quality homes and resort clubs, but without our lifestyle programming these are just neighborhoods, not communities. We want to create experiences that result in real friendships and new relationships." With a strong social program and long list of clubs and activities, residents feel more at ease in pursuing new friendships within active adult communities. Trilogy’s study also showed that retirees prioritize activities and programming within a community clubhouse rather than the size of the clubhouse and list of amenities offered inside the building. Programs and events like Trilogy’s concert series, The Good Life Festival at Encanterra in Arizona, features live music, food, artisan shops, and activities in a fun, outdoor setting. Trilogy also offers homeowners a cross-community travel program called Explore 360, which is planned and coordinated by a National Lifestyle Director, and allows residents to travel with other fellow Trilogy members all over the globe. Thanks to Trilogy’s innovative approach to the active and social lifestyle in each of its communities and resort-style clubhouses, residents have numerous options to stay connected with other members as well as explore new interests no matter where they live.